Wedding band Umbria Italy - Hire a professional wedding band in Umbria. Wedding Band Umbria Italy – Hire a professional wedding band in Umbria!! – Why get married in Umbria? 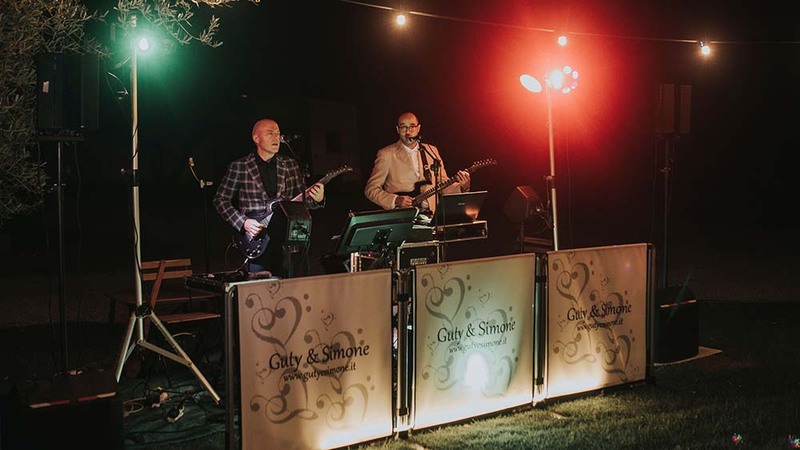 – Why “Guty & Simone” wedding band? Umbria is the only Italian region with no coastline and it’s known as “the green heart of Italy”; more and more people are visiting this awesome region (apart from the usual tourist destinations as Venice, Tuscany, Amalfi coast, Rome etc..) and even more husband and wife-to-be from all over the world get married in this area and…..our Wedding Band Umbria is based right here, on the shores of Lake Trasimeno!!! Umbria’s everchanging, untouched landscapes in the green of winding valleys will never fail to amaze you!! !Its uniqueness derives from its fusion of art and nature, Renaissance masterpieces and small Medieval towns. We constantly play here; during the last years we’ve played in quite all the wedding venues in Perugia, Lake Trasimeno, Assisi, Città di Castello, Foligno, Montefalco, Gubbio, Orvieto, Spoleto, Terni, Todi, Valnerina, all over Umbria, neighbouring regions and the wider Italy. If you’re looking for something special for your wedding our Wedding Band Umbria Italy can help you!! You’re now making your dreams come true!!! You want enjoy this special moment with family and friends and you know how much music is important to make your wedding memorable, romantic and…funny!!!! You can trust on us!!! Couples of all nationalities have come to depend on us for our musical talent as well as for our professionalism and reliability. During the last years we’ve played in quite all the wedding locations in Umbria! Our Wedding Band Umbria Italy knows how to throw a wedding party!!! We set the stage for a great entertaining, relaxing and fun filled experience for everyone of all ages. 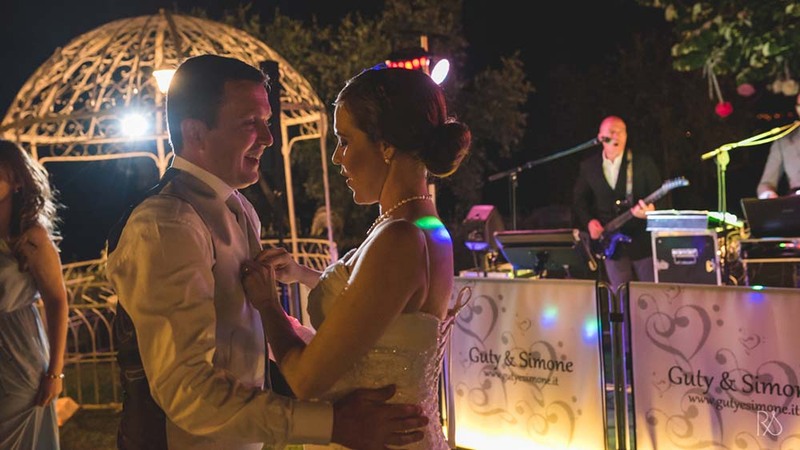 So whether it’s Top 40 Dance, Disco, Oldies, Rock, Pop, R&B or a great dance mix of everything in between – Our Umbria Wedding Band does it all with considerations keeping you and your guests in mind. And when you put it all together, you will have a memorable event that everyone will talk about for years to come. Our Wedding Band Umbria Italy is not only a music band, it is a full sound and lights design for events. What’s included: Live & DJ music!!! Guty & Simone the Umbria Wedding Band have a wide repertoire including all musical genres from the 50’s to present day: Italian and International Pop, 70’s-80’s Disco, Latin, Rhythm and Blues, Ratpack/Swing, Rock, Reggae, Country and Folk etc..
Our Wedding Band Umbria Italy can also accept DJ requests on-the-fly since we can access the web through our own Internet connection!!! In addition to the standard package our Wedding Band Umbria Italy can also organize the entire music entertainment for your BIG DAY!!! – Ceremony music: Violin – Harp – Harp, Violin – Harp, Violin and Soprano voice – Keyboards, Soprano voice – Piano, Tenore and Soprano voice duo – String quartet – Classical guitar – Ceremony DJ and Audio microphone service etc..
– Audio & Lights rental for weddings: Fairy Lights, String lights, Sound systems/Light systems and consoles for DJs, Wall Uplighting etc..
– Wedding Band Umbria Italy will help you also to pay ONLINE the SIAE music tax fast & easy from your home, wherever you are! !